After the success of our first 24-hour marathon in 2016, we were delighted to hold our second event, which ran from 7pm on Friday 23 June to 7pm on Saturday 24 June. This year it was Team Nadal v Team Federer and our sponsored players did not disappoint during the 24 hours with great tennis and great fun had by all. In the end, Team Federer won out. Once again, the barbecue was on the go and even the odd drink was consumed throughout the duration of the marathon. A thank you goes to everyone who took part. 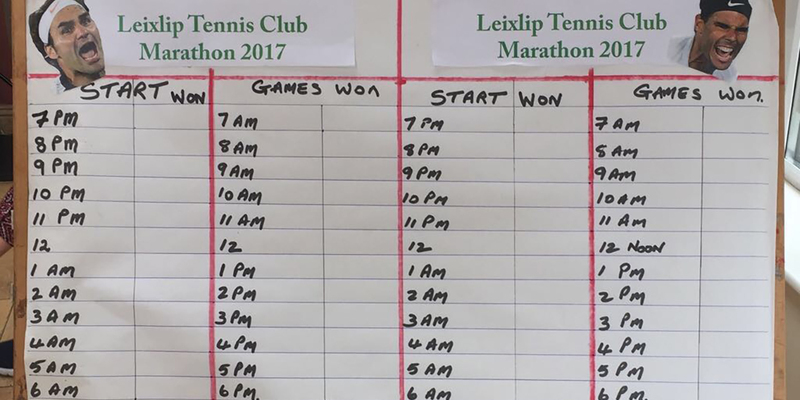 In addition to having a great time and playing some fantastic tennis, over €2,000 raised, which will go towards the development of our clubhouse. A big well done goes to all of the organisers, in particular Enzo and Annemarie Dowling, who planned and ran the event. Over the 24 hours, not to mention Chef Enzo’s barbecue, which was very well received.